The Barbet is a rare large water dog with a wooly curly coat and webbed feet. They have a large round head and a short, square muzzle. They have long ears that fall on the sides of their heads and eyes that sit at the same level as their ears. Their face is covered in curly, corded hair and they have either black or brown noses. They are big boned with muscular legs and a wide or large barrel chest. Their feet are large and webbed with fur covering the paws. They have longer tails that they hold up when exercising. Their coats are generally a solid color either being grey, black, brown, tan, fawn, ect although some have markings on their coats. Being a water dog, their large coats allow for their thick skin to be waterproof which helps them in colder temperatures. This dog is very friendly, outgoing, and loves to learn. Similar to other large breed dogs, the Barbet may develop hip and joint issues. These dogs do better in a house with a yard and somewhere new to explore every once in a while. They are not recommended for a small apartment or small living space. The Barbet needs a moderate amount of exercise as they are bred for the water. They love swimming with their webbed paws and running around outdoors. They enjoy learning new tricks which will help with their mental exercise as well. 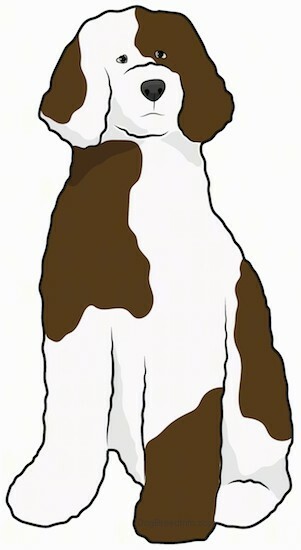 Because of their long, curly coats, this breed needs to be groomed frequently and washed when needed. This breed has been around longer than records were kept. They were used by the french as a working and hunting dog longer than anyone can recall. 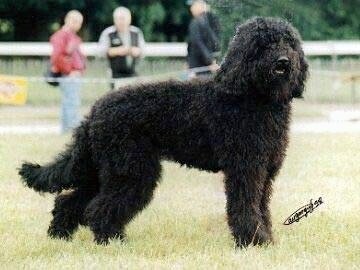 The French Water Dog became an official breed in 1880 under the name Barbet which translates to “beard” in french. The year 1387 was the first time anything about the French Water Dog was recorded in a book. In 1570, the French Water Dog was categorized as De Canibus Britannicus in a book written by Queen Elizabeth’s doctor, Dr Johannes Caius. This book was originally written in Latin and then translated in 1576. The English translation of the French Water Dog was put under a hunting dog group, also known as Aucupatorii. These included setters, water spaniel, and water dogs. In the Sixteenth century, the French Water Dog became known as the Barbet (“beard” in French) because of their wooly coats. Since these dogs were always around and in swamps, they were also nicknamed the mud dog. We know this dog was owned by royals in 1587 because of a comment made about King Henry IV’s mistress claimed that she had attended church with a Barbet. The dog was still popular in the 1700’s when a book claimed that the Barbet was a man’s best friend. Paintings were made portraying the Barbet near a swamp in 1889 with comments that claimed Barbets were happy to be near the water for hours, no matter what the weather. Their curly fur would keep them warm and protected by the cold lurking underneath the muddy swamps. Many countries thought of the Barbet as a French version of a Poodle, making any dog that was long haired and curly known as the same group. Later, these similar dogs would be placed in groups and known as different breeds. Some were known as Bichons, others were Poodles, Barbets, etc. The dogs known as the Barbet were bred with Griffon Korthals, Griffon Boulet, and other gundogs of the sort. This enhanced the breeds hunting skills and led to a more balance dog breed. Finally, in 1880, the Barbet became an official dog breed as a standard for this breed was written. In 1884, a French magazine called "Le Chenil" published an article featuring the Barbet which led to the breed becoming even more popular. The Poodle and the Barbet were still used interchangeably in certain situations and even today they are still similar in appearance. When they were first categorized, the two breeds looked comparably different even though they were both descendants from various water dogs. Poodles were a more refined breed than the Barbet. The Barbet was a Griffon breed with long curly hair and was classified as a working dog. In 1995, a dictionary referenced the Barbet under the name Griffon d’arrêt à Poil Laineux which translated to “wooly-haired pointer”. The Barbet was described as intelligent, loyal, friendly, and a lover of the water, even if it was cold. Many other breeds have traits of the Barbet as the Barbet was a perfect companion dog. Dogs related to the Barbet include dogs such as the Newfoundland, Briard, and the Bichon Frise. There were only two breeders on the Barbet left before WWII and only a few Barbets left after WWII. About 20 years after WWII ended, the breeding of the Barbet began once again as a hope to revive the breed. 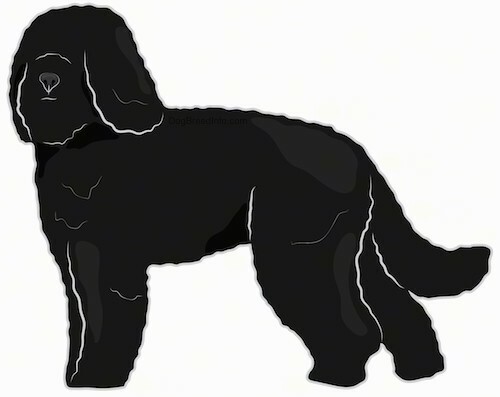 Today, this dog is known as a rare dog because there are still said to be some Barbets left although they are not as popular as they were before WWII.